4x10 Bass Guitar Speaker Cabinet Model # - MB-410 Woofer - Four 10" each has a 50oz magnet with a 2" kapton voice coil 400 Watts RMS - 800 Watts Peak Wired at 8 ohms 40Hz - 5000Hz Sensitivity: 98 db 5/8 plywood front panel Black tolex with black metal corners Recessed handles Full Metal Grill Terminal cup with two 1/4" and two speakon inputs Volume Control for horn 24.5" tall - 23" wide - 16" deep Weight: 91 lbs per cabinet This speaker cabinet is brand new. 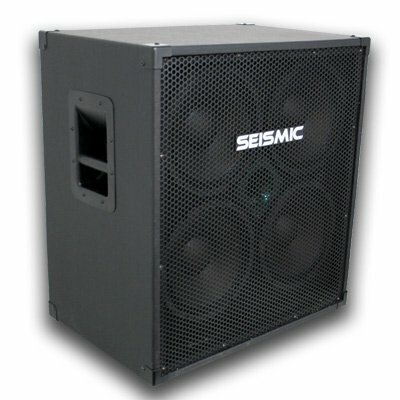 One year warranty4x10 Bass Guitar Speaker Cabinet with Tolex Cover and Volume Control is capable of the full range frequency response that has become such a staple of modern bass playing.This 410 has a punchy bass response. It is very clear and has a distinct sound and tone. Woofer - Four 10" each has a 50 oz magnet with a 2" kapton voice coil. Wired at 8 ohms. 5/8 plywood front panel. Black carpet with black metal corners. Recessed handles.